Composite decking such as TimberTech is easy to maintain, incredibly durable, and Arnold, Maryland homeowners really appreciate the increased home value. Composite decking is all the rage nowadays, and for good reason. Composite decking such as TimberTech is easy to maintain, it is incredibly durable, and Arnold, Maryland homeowners really appreciate the increased home value. Have you always wanted a deck, but you just can’t commit to the constant maintenance of wooden decking? If so, composite is the way to go. While wood decks require costly annual sanding and staining – Yuck! – composite decks are what we like to call low maintenance. All they require is the occasional cleaning. And for that, all you will need is a garden hose. With TimberTech, you are able to own an aesthetically pleasing deck without all the maintenance. Wooden decks can splinter and wear away before your very eyes. TimberTech composite decks, meanwhile, are made with high quality materials and built to last. While a wooden deck has an average lifespan of 10-15 years (with regular maintenance), a composite deck can easily last 25 years or more. TimberTech’s 25-year, transferable warranty certainly doesn’t hurt either. A new composite deck has an average return on investment (ROI) of 77% here in Arnold. This is even higher than the national average – 68%. And we know what you’re thinking. Doesn’t a wood deck have a higher ROI? Well, yes. You are correct. 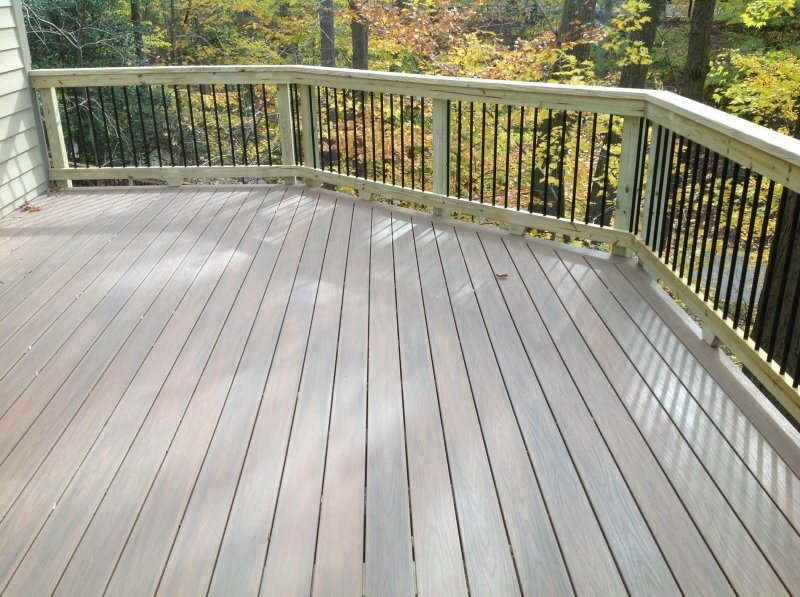 The average ROI of a wood deck in Maryland is 83.3%. However, return on investment only takes into account the difference between selling price and the initial cost of the project. So, because composite materials cost more than wood and both style of deck add roughly the same amount of home value, wood has a greater return. In order to truly understand the value of a composite deck we must look at the Total Cost of Ownership (TCO), which is a financial estimate intended to help homeowners determine the direct and indirect costs of a product or system over its entire life. In layman’s terms, TCO takes things like yearly maintenance into account to determine the true cost of a project. When looking at TCO, composite decking is much more comparable to, and at times surpassing, wood decking for two big reasons: durability and maintenance. Freedom Fence and Home, which servicers the Arnold area, provides deck construction for homeowners who want to improve the look, and value, of their homes. Our crews are highly trained and have been performing deck construction for years. You can view our gallery to familiarize yourself with our work. If you have any questions about TimberTech Composite Decks, please contact Freedom Fence and Home by calling 443-271-6841 or visit our website. You can also follow us on Facebook and Twitter! This entry was posted on Friday, July 24th, 2015	at 7:11 pm	. Both comments and pings are currently closed.